I kept trying to come up with names for this- one more goal off the list, another PR- I don't even know. So anyway, my first real A race like train for taper for, was Wallis Sands. Coach convinced me to do a early season half marathon just to see where things are going into the season. Worked out well after doing Cherry Blossom at the start of April. The other win- SUPER flat course. YAY!!! Coach and I had the goal of 2 hours. 120 or bust! Well the bummer was on Thursday I ended up catching whatever is going around the office and was down and out sleeping all day long. Friday was more of the same. I was starting to worry if I was going to be a DNS nevermind actually PR. Saturday things started to get better so I came up with my race plan. When I asked Coach if I should race the response was "shoot for the stars!" So the race plan was with the goal of 2 hours. I kept it skinny- like most run race plans. I had the food plan the drive plan and most of all paces laid out. 9:09 was the goal pace for the race to get 2 hours. I figure with the variation in courses if I kept it at a 9 I would be good. Contingency plan, 9:30s that would still give me a PR over my previous half marathon of 2:16. I drove myself up to the race. D wanted to do a 5k back home and I didn't want to possibly screw that up by trying to get us both to both races. 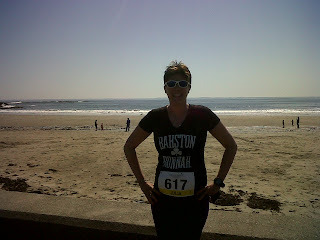 I bought a new shirt after the Boston Marathon events "Bahston Runnah" I had seen it at the Marthon expo and I figured it was my way to give my nod to being a runner from the area. 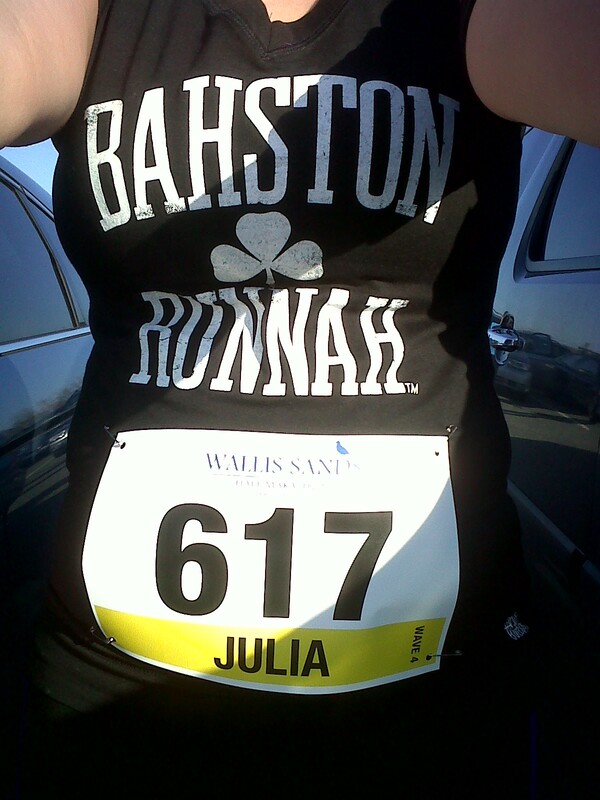 When I looked up my bib number I nearly screamed what?! 617?! OMG! If you aren't from the Boston area- this is the area code for Boston and has become the unofficial jersey number for Boston Strong. 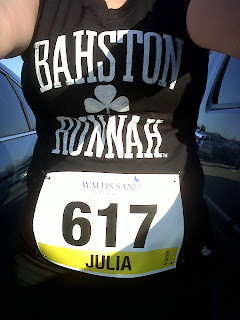 So here I am Bahston Runnah shirt and Bib 617. I figure my race day is already pre determined. I have no say in this. I am going to do the best I possibly can! I am going to push as hard as I can! I figured either I was going to go down in a blaze of glory bonk or I was going to push to the best Half Marathon I have run to date. Miles 1-3- 8:47, 8:46 (trying to drop the screaming ladies), 8:52 Reached the 5k point (estimated) under 30 min. I start thinking okay find the rhythm 9's is the focus. Miles 4-6- 8:58- had my gel and grabbed a sip of water at aid station since I didn't know when the next one would be, 9:10, 9:00 - to be honest I started kinda zoning out and just running not really thinking or focusing too much on the race. Okay come on head in the game. But I was still at the 10k point a little before an hour so I thought okay we are good. Miles 10-12- 9:11, 9:35, 9:51- mile 10 I talk myself out of the its okay not to push talk. And get back in the game. At this point whatever has been happening with my shoulder/neck is starting to really hurt and I can't keep an eye on pace. So I did the just run. Just keep running and see how it works out. But at this point my cough started to kick in. Somewhere in Mile 12 I actually did the lets push this into hurt stage. Dig deep. And when I went to push it to the point where I knew it would be hard to catch my breath I couldn't breath cue the cough. I had to walk a couple steps and this girl did the YOU CAN DO IT! Were almost there. Mile 13- 9:41- Caught my breath stopped coughing and pushed it to the finish. At this point I hadn't really been watching the clock too much I just wanted to get over the line and see the result. Mind you I started 15 min after the actual clock started so I crossed and was a little out of it did a little aw man- clock read 2:17. As I walked through the chute my brain came back on and I looked down at my watch 2:02:33. I smiled EAR to EAR! The guy on the other side of the barrier must have seen the change in my face and offered up a high five! I grabbed some water and headed to sit by the ocean and tell everyone my results.I was so proud of myself to push to a 14 min PR! 14 min- that is more than a minute per mile faster pace! 2:02! 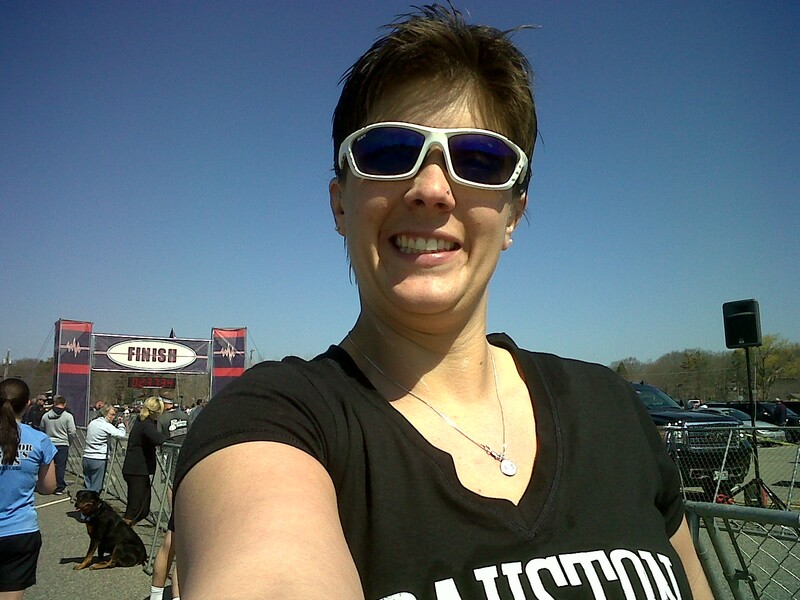 Wow I am a 2 hour half marathoner, my first half marathon was a 2:29. I think that maybe by the next stand alone half marathon I do I will have a sub-2 hour result! Coach is convinced if I had been 100% this would have been sub 2, I have to agree. But- I can't fight with 2 min off my original goal! Especially with being sick! After the run I got to have lunch made by my coach and hang out with her awesome kids. Then I got home just in time to catch D on his 5k. I got out as much screaming and cheering as I could and yelled him into the finish. All in all the perfect day- Great Race, Wonderful Lunch and Support!